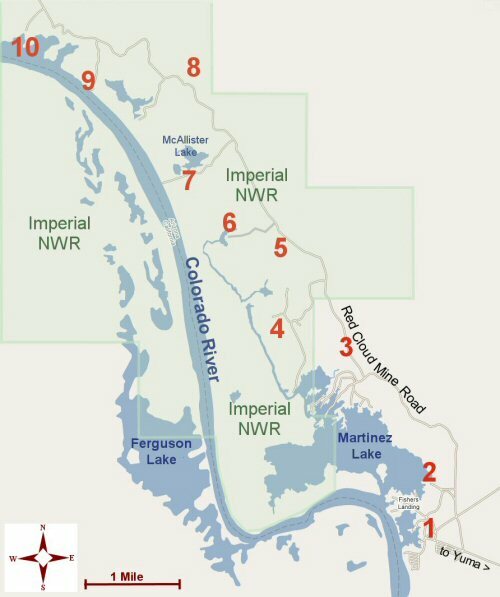 About 45 minutes northeast of Yuma, AZ, the Colorado River flows for 30 miles through Imperial NWR and fills Martinez Lake on the south side of the refuge. This 25,765-acre refuge is an important migration and wintering stop for thousands of waterfowl, many of which can be seen from the observation tower. North of the headquarters and the closed area are several lookout points that offer fine views of the river and backwaters. The Red Cloud Mine road and the “Painted” desert nature trail are great places to look for desert birds like Phainopepla, Verdin, and Lucy’s Warbler (early spring). Cottonwood and Athel Tamarisk groves harbor Summer Tanagers and Blue Grosbeaks. As with Mittry Lake, a canoe or small boat is a great way to explore the river, Martinez Lake, and the many backwaters. This community of trailers and homes has scattered palms, both ornamental and native trees, and small gardens which at­tract resident Hooded Orioles & doves, migrant tanagers, Gambel’s Quail, and sparrows. 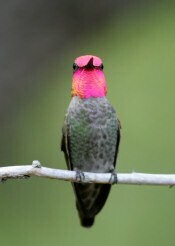 Feeding stations, such as the one in front of Martinez Lake Restaurant, attract verdins, quail, and four varieties of hummingbirds. 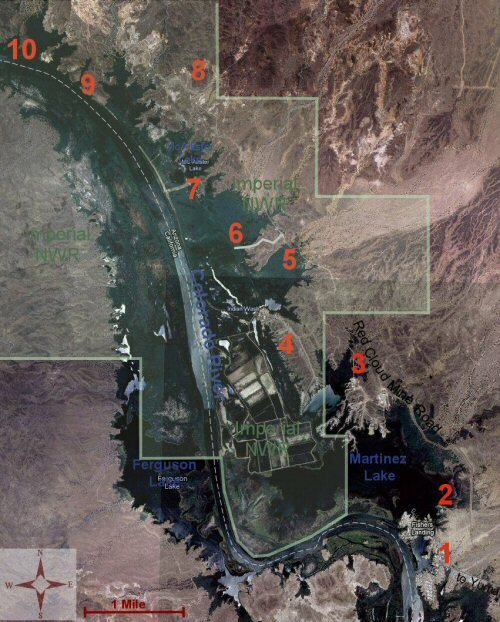 At the south end of the community is a nice overlook at the edge of the Colorado River. From here you can watch for Bald Eagles, Peregrine Falcons, gulls, terns, and waterfowl. 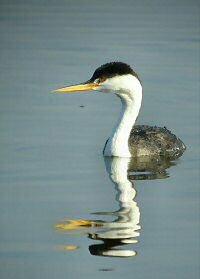 From the restaurant or the boat dock look out over Martinez Lake for Clark’s & Western Grebes and other waterfowl. Walk out to this elevated point along side the Sheriff’s Station for a good view of Martinez Lake. The cattail marsh next to you has Virginia and Clapper Rails. The lake itself is good for a variety of ducks, mergansers, gulls, and terns. Osprey is here year-round, and joined in winter by soaring harriers and falcons. The portion of this road just south of the refuge headquarters is good for Lucy’s Warbler and Crissal Thrasher in early spring, and usually has lots of resident Phainopeplas. Where there are more mature trees, including large stands of Athel Tamarisks, look for Summer Tanager and Blue Grosbeak in the spring and summer. Spring is a wonderful time here, with good numbers of warblers, flycatchers, and vireos stopping to rest and feed. During the 2006 winter we had a good selection of rare wintering passerines: Eastern Phoebe, American Redstart, and Chestnut-sided Warbler. In desert areas look for resident Black-throated and wintering Sage Sparrows. Although this platform isn’t very high, it lets you peek into the closed portion of the refuge. Views are long-range, so bring your scope. Snow & Canada Geese are usually visible in the winter months, and migration can turn up White-fronted Geese and Sand-hill Cranes. Bald Eagles are sometimes seen soaring overhead or perched on a distant cottonwood. Join us on a Christmas Bird Count to get a closer look at the myriad waterfowl and passerines in the closed area. During the 2006 winter we had a good selection of rare wintering passerines: Eastern Phoebe, American Redstart, and Chestnut-sided Warbler. Keep an eye out for bobcats in the area—we often see them. In this large stand of Athel Tamarisks look for Summer Tanager and Blue Grosbeak in the spring and summer. Spring is a wonderful time here, with good numbers of warblers, flycatchers, and vireos stopping to rest and feed. This is also a favorite haunt of mosquitoes in all seasons but winter. We saw a badger here in October 2007. Drive to the end of this road (very slowly if in a car) and look out over the pond and the Colorado River Valley. The pond makes a rough horseshoe, and you’ll need to do some walking around to see into different sections. It’s good for all three teal, Hooded Merganser, other waterfowl, herons, accipiters, kingfish­­­ers, Black Phoebe & Ash-throated Flycatcher, and sparrows. A small pond at the end of this road had an unexpected Tundra Swan one winter. Look for Cinnamon Teal and other puddle ducks, as well as most of the birds you can see from Palo Verde Point. This one-mile loop trail winds through colorful canyons and over low hills, providing a good introduction to the southwestern Son-oran Desert. Unless you come here at the height of migration, you’re likely to see more lizards than birds. Ladder-backed Woodpecker, Verdin, Phainopepla, and White-crowned Sparrow can be found here. At night look and listen for Great Horned Owls, Lesser Nighthawk, and Common Poorwill. At the end of the road you’ll find a much larger body of water and what is often the best selection of birds in the area. Grebes, mergansers, and both shallow and deep-water ducks feed along side each other here. Terns and gulls are here in season, and the surrounding reeds are good for Least and American Bittern. We’ve heard Clapper and Virginia Rails in addition to Soras. It’s not uncommon to see burros and coyotes around here, too. This point is just north of Yuma County, but the narrow river channel/canyon makes a nice funnel for birds moving up & down, or migrating along the Colorado. Waterfowl, pelicans, gulls, terns, and raptors can all be identified easily here. From the store, drive back east on Martinez Lake Road for .5 miles to the intersection of Red Cloud Mine Road.